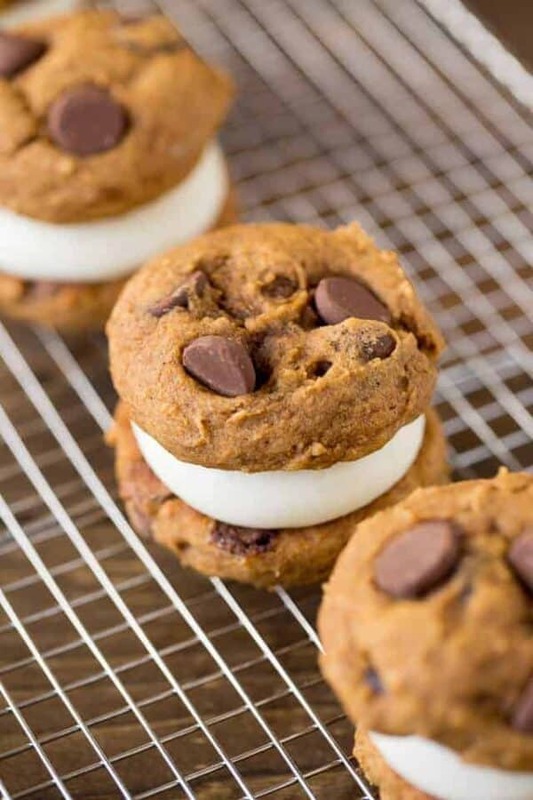 Pumpkin Whoopie Pies are made with fluffy pumpkin chocolate chip cookies and a delicious cream cheese filling to create the perfect dessert for fall. This recipe for Pumpkin Whoopie Pies a guest from my ultra-talented friend Lizzy of the blog, Your Cup of Cake. Be sure to check out her site for tons of baking inspiration and gorgeous photography. Her Banana Bread Coffee Cake and Pumpkin Cream Cheese Pie Bars are sure to make you swoon! I’m so happy to be back guest posting for Jamie! I’m Lizzy, the blogger behind Your Cup of Cake and I love baking up a storm every day. Halloween is just around the corner and every store I walk into is decorated with orange and black and smells like pumpkin! It’s the best time of year because this costume covered day starts off the big holiday season! So bring on the trick-or-treaters and silly string. 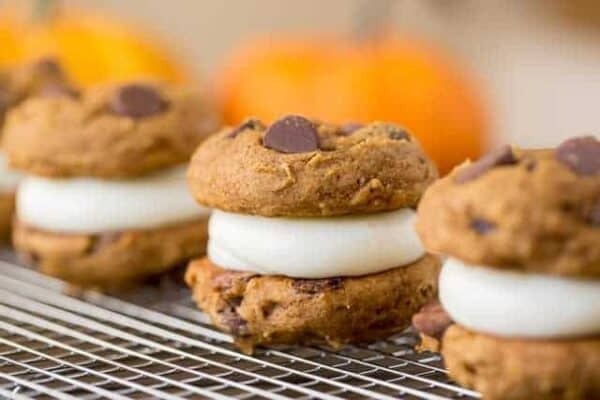 Pumpkin cookies are a classic fall treat, but to take it to the next level I decided to make them into pumpkin whoopie pies to create little cookie sandwiches. This is my favorite treat to take to parties because I can make them the day before and they travel great! Pumpkin desserts actually taste better the next day! The flavors need time to develop so make your pumpkin pies and cookies the day before you need them. As for traveling, I make a ton cupcakes, but when I take them to parties I have to drive like a grandma. 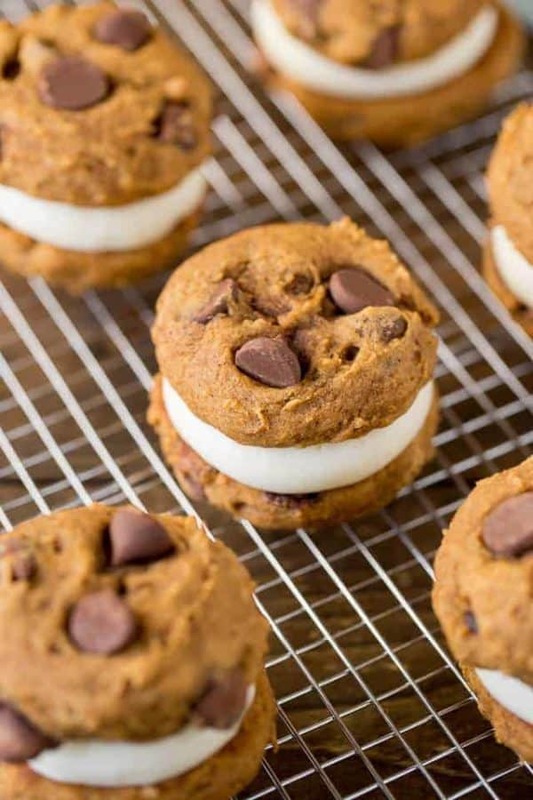 These pumpkin whoopie pies are so much more friendly on the road! If you don’t already have a food scoop, you need one! 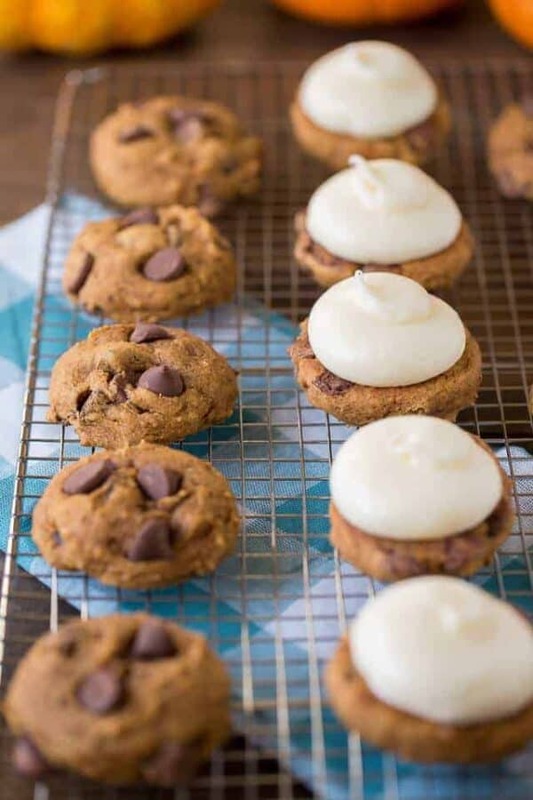 They’re the best cookie/cupcake tool because your cookies will all be the same size and perfectly rounded and your cupcakes will all be the same size too! I like the black and purple ones for small cookies and the yellow scoop for cupcakes! If you want those massive bakery cookies, use the blue or green scoop. I love using milk chocolate chips in my pumpkin cookies but feel free to use semi sweet or every mini chocolate chips! Even bits of toffee would be incredible! Or your could add cocoa to the cream cheese filling… so many awesome options! In a medium sized bowl, whisk together flour, baking soda, baking powder, pumpkin pie spice and salt. Using a stand mixer beat sugar, brown sugar and butter together. Scrape down the sides as needed. Add in pumpkin, egg and vanilla extract and beat again. Scrape down the bowl to incorporate everything evenly. Slowly add in dry ingredients and chocolate chips. Stir just until combined. Do not over mix. Scoop out dough balls roughly the size of a heaping tablespoon, place them on cookie sheets and bake for 9-11 minutes. Let cool. Beat cream cheese and butter together until smooth. Add vanilla extract and 1 cup of powdered sugar. Continue to slowly add powdered sugar until you reach your desired consistency. 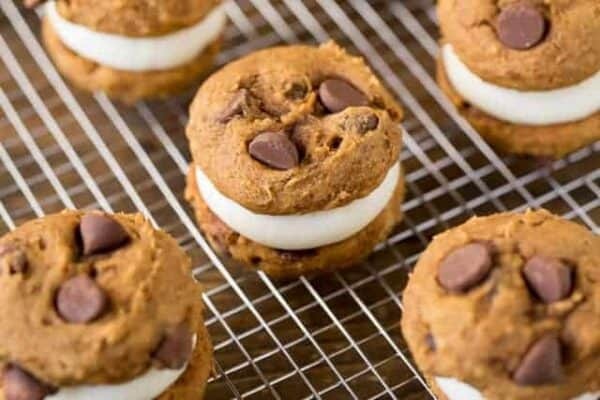 Frost the bottoms of half of your cookies to make your cookie sandwiches. Top with a “blank” cookie and serve. I love them best cold, so I store mine in the fridge before serving. I use to send my Kelly pumpkin whoopee pies for her birthday when she was away at college! She would have loved these! Thank you for the lovely idea for next weekend. Some guests are arriving to my place and this is just what I needed since I made pumpkin spice from scratch yesterday. Thank you so much ! I hope you enjoyed them as much as we did! Happy Holidays to you and yours! OMG! How sweet! 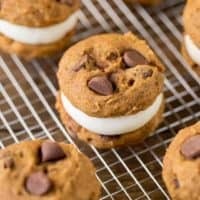 I love pumpkin cookies AND whoopie pies, so this looks absolutely wonderful. I’m going to make these for myself this weekend! Thanks for sharing! Do they freeze well? And for how long? They look amazing!